OLD PARADIGM (Separation-Based) REALITY is built on a conceptual template called "I am." It begins with personal experience, and moves out from there. Metaphysicians, Yogis, and Channels, who are constantly receiving "new" data from the Multiverse, try to find ways to integrate what they are getting within this design template so they can stay "user friendly" with those still steeped in Separation Mindset. The ancient adage "seeing is believing" carries a lot of weight in 3D society. In fact, any involvement with our five physical senses adds credence to Multiversal data as it arrives. So, when it came time to integrate the idea "I am more than my body" within our Mass Consciousness, humanity began having OBE's (out of body experiences), to embody the concept. In a classic OBE, a person's physical body becomes quite relaxed. Many travelers describe a "tingling" in their limbs and a "buzzing" in their ears, followed by full-body numbness. This temporarily feeling of paralysis is meant to de-emphasize physicality so an astral body can emerge and begin functioning. This is similar to "turning down the lights" in a movie theater, so the "show" can begin. Robert Monroe, that great pioneer of Astral Travel, referred to this condition as "mind awake, body asleep." 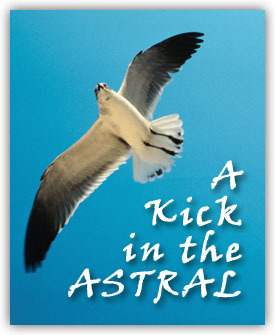 An astral body is an ancillary vehicle in which human consciousness resides and moves about. The Reconnections refer to these as fragments, or "frags," which can pilot portions of our viewpoint into new situations and environments, even as the rest of us remains nicely grounded in 3D. In their transmissions on "Spiritual Gifts," the Guides describe our Meta-Human (transformational) Brain as existing in two parts: the "test pilot" aspect and the "ground crew." Once the "mind awake, body asleep" condition is attained, an astral traveler will "rotate" out of the physical body and begin moving about the room. Some don't get as far as the ceiling, while others travel for miles and miles. In training sessions, students learn how to help each other "separate" from the body, so this dance of new realization can occur. As we mentioned in the first part of this series, OBEs are designed to convince and educate those who still have trouble believing that root premise "I am more than my body." During the time Robert Monroe was in physical form, he wrote three books on the subject: Journeys Out of the Body, Far Journeys, and The Ultimate Journey. The latter volume was about death, and he wrote it shortly before he passed over in 1995. Those who wish to be initiated in OBEs, or study more of Monroe's work can contact The Monroe Institute in Faber, Virginia. They are still very much in operation, and regularly conduct seminars and experientials in the process of astral journeying. New Paradigm (Oneness-Based) Reality takes the premise "I am more than my body" and expands that idea to infinity. Fortunately, a journey to infinity can be a comfortable stairway, graduating a person in levels that are exactly proportioned to his (or her) readiness to move. Two of those levels involve the Fourth and Fifth Dimensions. We know that 3D integrates the ideas of height, width, and depth. The Fourth Dimension allows for manipulation of time, and the Fifth Dimension begins a gradual abbreviation of defined space. In Oneness, the ideas of "there" and "then" are illusion. In Oneness, everything is here and now. But 3D Sensory Technology separates that idea, so that an experience of linear continuity is established. Through a process of Fragmentation, a Oneself Being scatters his various "game pieces" across a special "board" which is designed to explore whatever he wishes to explore about self. A classic OBE experience simply creates a new "game piece" with which to work. I would never suggest that classic OBEs go out of style, or lose their impact. What I am seeking to add to the picture now is the realization that each of us is astrally traveling, via our "frags," every moment of the day. There are many "test pilots," coming and going, even as there are "internal translators" who are waiting to download and process the information they have obtained. Remember those cute little "probe droids" that were seen, throughout George Lucas' Star Wars movies? A Pilot Self is very similar to that, only he/she appears as an energetic replicate of a traveler's entire being. Internal perceptual editing insures that the conscious mind only becomes aware of all these "journeys" when it needs to. Otherwise, we would go crazy. An OBE, therefore, is like a "demo" program, illustrating for the conscious mind how all this stuff works everyday. Since we are truly one with everything and everyone, a bona fide "frag" doesn't always have to be made in the image of our 3D body. We can visit and broadcast information from anywhere. When I write a transmission which begins "From The Reconnections," I am transferring emphasis from my Daniel-Self to my Reconnections-Self. Each glimmer that is seen in the water, each rainbow that dances among the clouds is a potential Multiversal Vehicle, waiting for someone to jump aboard. All we need is a touch of Imagination, accompanied by a slight diffusion of consciousness. We pause ... amidst our hustle and bustle of life. We take time to open, not just to what is obviously before us, but also to what else could be there. And when we do, off we go. Though the 3D universe is built upon the premise "I am," the Fourth Dimension (and beyond) is build on a design template called "Suppose I were ..."
When gazing at something - like a candle, perhaps - we train ourselves not to look directly into the flame. Instead, we look just off to the side, just beyond the light. The Reconnections call this looking "askance." As it is in the world of animals, so it is in the Realms of the Unseen. If you look directly at someone, they assume that you want to fight. So they put up a shield. The quickest way to close a portal is to move directly toward it. But if you sidle up next to it, slowly and respectfully ... some wonderful journeys are in store. Once a person has gotten over the "kick" of his lift-off from a 3D body, the next "kick" will come from downloading and collating all the data he has acquired on his journeys. In the Spiritual Gifts Info (mentioned above), the Reconnections demonstrate potential "job descriptions" for those who assist in the unfoldment of Planetary Awakening. Some people are "Imagineers" (star pilots) while others are "Transposers" or "Calibrators" for info that is brought back to earth. This division of labor can exist within a single person, in his "frags," or it can also be seen in a functioning Reconnections Community. Discovering our primary and secondary "Charismaton," or "Grace Gifts" is one of the great benefits which flows from humankind's Return to Oneness. In the 1990 movie Total Recall, Arnold Schwarzenegger lives in a futuristic, electronic age where the idea of physical vacations has been replaced by experiences called "Total Recall Implantations." During the process, a memory chip is placed in a person's head, which introduces memory of what (supposedly) happened when the "client" and his wife visited a remote and beautiful island. For me, this concept was quite revolutionary. It began my speculation about life in the vein of: "Is it real, or is it Memorex?" The Reconnections now share with us that ALL extra-sensory impressions, from whatever source they emanate, are real beings or objects. They actually exist within the Multiverse. Whether or not they are allowed to become solid and develop attachments within one's 3D universe is a matter of negotiation, carried out before a life experience is designed and implemented. There's a great scene in the movie K-Pax where the extraterrestrial Prot (played by Kevin Spacey) is demonstrating Light Travel to a group of astronomers, who can't quite decide whether they believe him or not. One of the doctors says: "Can you demonstrate this Light Travel for us?" Prot asks his own physician for permission, and then proceeds to stand there, totally still. They all wait a minute or two, and then one of the scientists says to Prot: "When are you going to leave?" Prot responds: "Oh, I'm already back." They all laugh and shake their heads. Prot isn't laughing. What happened to him was very real, indeed. As we all move forward into this next era of conceptual expansion, let's not allow ourselves to fall into the skepticism shown by those scientists. In the New Testament, Jesus said to Doubting Thomas: "You have seen and now you believe. Blessed are they who have not seen, and yet believe." By saying this, Jesus began to illustrate for us all that there are "eyes of faith" which supersede physical sight. The Reconnections imparted a good deal of this information to me when I first visited Stonehenge in 1994. This was just prior to my coming online and beginning my work in cyberspace. At the time, they mentioned an "Arc of Energy" which was to be our electronic simulation of Multidimensional travel. This "arc" was an energetic version of Noah's "ark" from the bible. You upon this Planet Earth are engaged in a wonderful process. You are packing for a grand and glorious journey. You are taking everything that has meaning to you - art, knowledge, music, philosophy, spirituality, personal finance, family geneaology and history, and so on - and you are projecting it out, into space, via electronic gadgetry. You are taking it with you on this magical journey. When you pack for this journey, you must pack light ... because it is the only thing that can go! This is a light vessel, and you are going on a light journey around the planet. You are creating an electromagnetic "band" around Planet Earth, filled with everything that has meaning to you. It is an arc made of electricity and it is carrying the best of your planet and its inhabitants (those who wish to go) to safety. The energy of the "band" is being conducted, around the planet, via what you would call "Power Spots" such as Stonehenge, the Pyramids in Egypt, the Mountains of the Himalayas, etc. The Earth is in for tough times. Get on the computer, for that is where this wondrous process will connect up! When I came out of trance that night, I saw images of fax machines, telephone lines, TV, radio, movies, computers, and all manner of electric gadgetry projecting images out into space. These images are people moving about in concentrated, electronic form. All of this physical activity is merely suggestive of an even greater expanse of activity going on in spirit. The physical is always just a dull shadow of the spiritual. And, so, in 1994, I went online. I bought my first PC, and set it up in my Bellevue Office. My life has never been the same since. Whether I am using an astral body to send out my "pilots," or I am doing it in e-mail, my Multidimensional Self is doing our work in a host of ways. All we need is the eyes to see it. And many of us are being denied the power to experience our OBEs until we learn how to see the "traveling" and connections that are occurring around us in 3D space. In our next segment, we'll talk more about "seeing" from the viewpoint of a Traveler, in a Multidimenional Ship, who merely appears to be living in everyday society. We'll also introduce the concept of a Crystal City, which is an amazing adjunct to our process of Reconnection. Daniel Jacob is a conscious channel, writer, and a Bio-Energetic Body Worker who lives in the Greater Seattle area. He owns and operates Myo-Rehab Therapy Associates, in Kirkland, Washington - a multi- therapist clinic, which specializes in muscular rehabilitation, stress management, and personal transition work. He has been in practice for 19 years. On 11/11/91, he began working with a group of energies that called themselves "The Reconnections." Daniel has developed a complete archive of information that has come through from them on a number of relevant topics. Daniel and his associates have been doing research with people around the world, collating data and comparing notes on the topics of Physical Transmutation and Earth Changes. He has produced a 2-Part CD, on which he explains the story of "The Star Children" in depth. He calls it a "tonal infusion for the New Age." You can get more information about Daniel and his work by visiting his websites: www.thestarchildren.com and also www.reconnections.net, or by e-mailing him directly at: daniel@reconnections.net.